During the 69th World Health Assembly in Geneva global leaders have reaffirmed commitment to ending polio once and for all. Last week, global political commitment to eradicating polio was affirmed at the World Health Assembly (WHA) in Geneva. 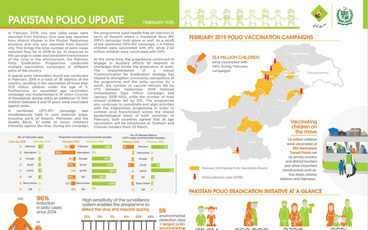 During the polio agenda item, member states discussed progress made in the last year and the remaining hurdles that stand in the way of polio eradication. In her opening address to the WHA, Dr Margaret Chan, Director General of WHO, said polio eradication has never been so close to the finish line. “During the short span of 2 weeks in April, 155 countries successfully switched from trivalent to bivalent oral polio vaccine, marking the largest coordinated vaccine withdrawal in history. I thank you and your country teams for this marvellous feat,” she said. Member states reviewed the latest global epidemiology, noting the strong progress made across Africa with no case of wild poliovirus in approaching two years. Delegates from Afghanistan and Pakistan, the final remaining polio endemic countries, outlined the steps they are taking to ensure that transmission is interrupted as a matter of urgency. With fewer missed children than ever before and just 74 cases across the two in 2015, achieving eradication has never appeared to be such an achievable target. 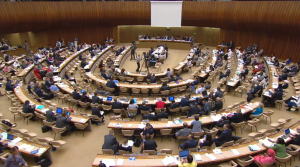 Many member states spoke to reaffirm their commitments to fulfilling the objectives of the resolution passed at the last WHA to commit to ending polio once and for all. Michel Zaffran, Director of Polio Eradication at WHO, stated that strong progress had been made against all four objectives of the Polio Eradication and Endgame Strategic Plan. Delegates also commended the historic achievement of the switch, warning that shortages of the inactivated polio vaccine and potential outbreaks of type 2 vaccine-derived polioviruses would be some of the major challenges of the coming year. They also expressed appreciation for the global contingency plans put in place to adequately manage the risks associated with the supply shortage, notably the availability of the stockpile of monovalent oral polio vaccine type 2. Gavi, the Vaccine Alliance, supported the interjections of several member states highlighting the importance of ramping up transition planning in countries to prepare for the end of the polio infrastructure after eradication. “To be sustainable, the decision on which polio assets to sustain must be fully led and driven by countries themselves, based on national ownership, national plans and investments,” said the Gavi spokesperson.